Are you thinking about taking on a basement bathroom remodel? There are a lot of reasons it’s a good idea. With a basement remodel, you can extend your living space and increase your home’s value. Your basement bathroom remodel could improve your home’s selling power, not to mention give you the convenience and luxury of an extra, attractive bath. Before you put forth a big remodeling effort, however, make sure you think through the entire project. Whether you’ll be updating the bathtub, putting in a new shower enclosure or changing everything from the ground up, here are some key tips to remember. Know your budget. 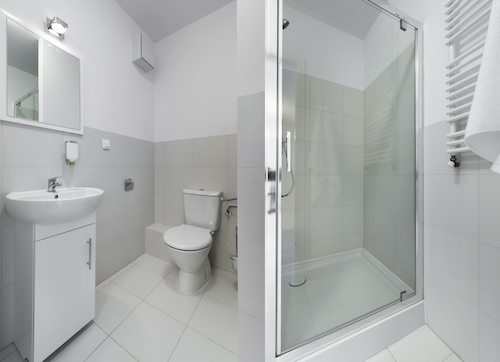 It’s as true of basement bathrooms as it is of any other part of your home — remodeling projects are notoriously more expensive than expected. Instead of going into the project waiting to see what things cost, decide upfront what you can and cannot spend. Shop to find the best deals on fixtures, using Modern Bathroom as an easy online resource for prices and deals. Pick a cohesive theme. The exciting thing about a remodel is the unlimited possibilities. At some point, however, you have to narrow your choices. To avoid ending up with a haphazard, subpar space, decide on a theme and stick to it. Maybe you’ll go with a certain color scheme, such as white on white. Maybe you’ll focus on a specific interest, such as a nautical theme or sports. Whatever the case, let that theme guide your design choices. Make the most of space. Whether you’re remodeling a tiny powder room or a large full bath, you can always make choices to expand the room’s sense of space. Use large mirrors to bounce more light through the room and create a larger feel. Instead of a traditional shower curtain, consider a glass shower enclosure that creates a seamless look. Incorporate lots of light. Use bright colors. If making the room appear larger is your goal, keep that in mind with all your choices. Explore sinks and showers. While a small room might benefit from a space-saving pedestal sink, a double sink vanity can add great functionality to a large bath. Explore the possibilities for different kinds of sinks and showers in order to pick the one that best suits your space. Be realistic about what you can handle. One of the biggest decisions in a remodel is trying to figure out whether to hire contractors or do it yourself. Before you assume one or the other is a better choice, look realistically at your capabilities, budget and availability. Will going DIY save you money, or will it possibly lead to mistakes and higher costs for repairs? Will taking on an extra project be fun, or will it overwhelm you in an already busy schedule? Be as realistic as you can about what you can handle. When remodeling your basement bath, keep in mind that your new space doesn’t need all the bells and whistles to provide added value. If you want to opt for little luxuries and they fit your budget, great. But if you have to prioritize what’s most important, know that even a simple, clean, updated bathroom is a great feature. When working on your next bathroom project, use the tips above to guide your progress. 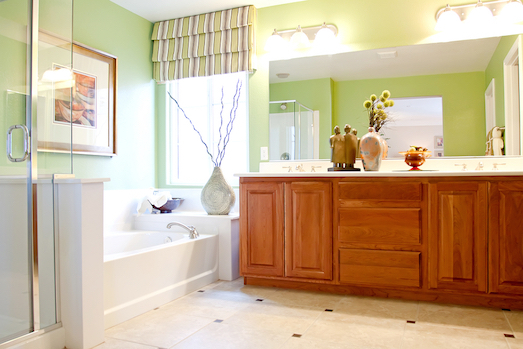 Taking on a bathroom-remodeling project can be both exciting and daunting. As fun as it is to dream up a new design, you also might have to make dozens of decisions. In the midst of it, it’s all too easy to believe that those decisions are opportunities to make mistakes. You could order the wrong bathtub size, or end up with an improper sink installation, and each accident potentially could cost you time and money — not to mention headaches and hassle. Fearing Commitment to a Theme. When you start a fresh remodeling project, you’re surrounded by possibility. That’s exciting. But if you don’t force yourself to narrow down those possibilities, you’ll end up with a hodgepodge bathroom or, worse, a bathroom that’s never done. Explore your options, but then narrow down the choices. Pick a cohesive idea for your bath, whether it’s nautical décor or white-on-white style, and let that shape the rest of your remodeling decisions. Ignoring the Importance of Colors. One of the biggest design decisions in any new space is its color scheme. Don’t make the mistake of worrying about color later. At the beginning of your project, decide what color scheme you want to use. This will affect everything from the floors you install to the fixtures on your sink. Minimizing Natural Light. At first glance, a bathroom without windows might not seem like a big deal, but you may feel differently later. No windows means giving up natural light as well as any sort of outdoors view. It means having to rely on artificial light. So if your bathroom doesn’t currently have a window, would it be possible to change that? Or if the window is tiny, could you expand it or add a skylight? Remember natural light is a great amenity, just as a luxury tub or heated floors can be. Not Adding a Fan. Whether or not you have a bathroom window, consider adding a bathroom fan. Regular showers and baths can steam up a bathroom quickly, and a fan prevents too much moisture from accumulating throughout the space. Forgetting about Flow. A big part of a good bathroom design is its flow. Where the vanity is in relation to the shower and how accommodating the space is to more than one person both are aspects that will affect how comfortable and usable the space feels. Likewise, think about how your new bathroom will fit the rest of your home. Will it be a natural extension of your style in the living areas, or will it feel like it doesn’t belong? Choosing the Wrong Sink or Tub. Even if you’ve always dreamed of a standalone tub, the fact is that not every tub works for every space. Your bathroom might fit a shower/tub combination best. The same goes for sinks. Before you order the wrong size vanity for your bathroom, think realistically about whether or not a pedestal sink might be the best fit for your tiny bath. Blowing the Budget. It’s as true for bathroom remodels as it is for any other home renovation project — you have to know your budget and stick to it. Don’t start buying for a $30,000 budget when you know you have $10,000 to spend. Set and stick to a specific amount, and avoid a mistake you’ll be paying for years to come. Making Small Mistakes at the End. It’s always easy to get lazy at the end of a project, but in terms of a bathroom remodel, this could mean big problems. 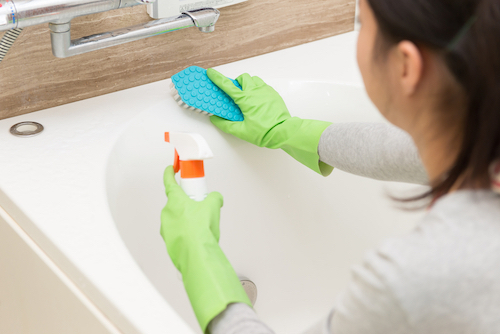 Whether it ends up being an improper tub installation or an improper shower installation, stay alert to potential problems so you can catch them early and fix them fast. Overpaying for Fixtures. The range of prices on bathroom features and fixtures varies greatly. That’s why, when you don’t know the best resources for good prices, it’s easy to overpay. Turn to Modern Bathroom, the web’s best resource for factory-direct prices on everything from tubs to vanities to toilets. We give you free shipping, as well as a 110% money-back guarantee if you find anything we sell for a lower price within 30 days of your purchase. Shop our catalog to learn more! Making the most of a bathroom-remodeling project is all about doing your research, paying attention and making one smart decision after another. Avoid the nine common mistakes above in order to make your project a success, and let Modern Bathroom help. Scale down to save space. Nothing cramps a room faster than components that aren’t scaled to its size. Rather than working to barely fit in that large vanity that takes away any empty space in the room, install a pedestal sink, for example. Instead of using bathroom storage shelves to house all your linens, toiletries and other bathroom gear, see what you can store just outside the room. As much as possible, scale down in what you keep in a tiny bath. This will help you think more strategically about what you should include. Go big with your mirror. When you’re working with a bathroom layout that’s small, try incorporating a larger, wider mirror. Rather than a mirror that appears just over the sink, look for one that can extend the full width of the room. Install a mirror that goes all the way to the ceiling instead of one that stops a few inches short. This can help bounce more light throughout the room and create an illusion of additional space. Try white on white. Create a bigger, brighter feel in the room by incorporating bright, white colors everywhere you can. Choose white fixtures, paint white walls, lay white floors and pick white accessories, mixing up their individual patterns and textures as you like. Using a monochromatic color scheme makes the entire space feel cohesive instead of chopped into small sections. Consider a glass shower. Glass shower enclosures save you the annoyance of regularly swapping out shower curtains while also making the most of small spaces. By eliminating visual barriers and maximizing natural light, they give the illusion of a larger bathroom. Pick luxury components. When you like the look of a luxury bath without the luxury price tag, a powder room or tiny bath is the perfect place to start. Rather than buying a double vanity with white marble countertops, for example, you might be able to incorporate a smaller, less costly piece of marble into the room. Instead of paying for both a whirlpool tub and a glass-enclosed shower, you can focus on one that you trim out with bells and whistles of your choice. While it’s true luxury elements are expensive, it’s also true that buying fewer of them means spending less money. Create a focal point. A bathroom that’s low on space is the perfect place to pick one especially eye-catching feature and focus on it. Find bold wallpaper you like and decorate the walls with it. Splurge on that marble shower. Incorporate the intricate tile you love into an interesting floor design. The beauty of a small bath is its potential for creativity. By thinking strategically about how to use the space, you can make your little bathroom feel bigger and more usable in the process. Have fun exploring possibilities using the six tips above! Repurpose vintage elements. Whether it’s an old farmhouse sink that you combine with antique furniture to make a vanity or a pair of vintage wall sconces used to illuminate your room, by repurposing vintage elements into your bathroom, you move toward rustic style. This design choice creates a wonderful sense of history and customization in your bathroom, too. Depending on your bathroom’s space, you may even add a vintage cabinet or dresser for extra storage room that can be moved whenever you like. Shop salvage. A great way to spot vintage pieces you want to incorporate in your bath is to shop salvage yards and markets. Features like pedestal sinks are always popular yet can truly run the gamut in terms of price — expect to pay anywhere from less than $100 to a few thousand dollars — depending on the sink’s quality, style and seller. Simplify the look. 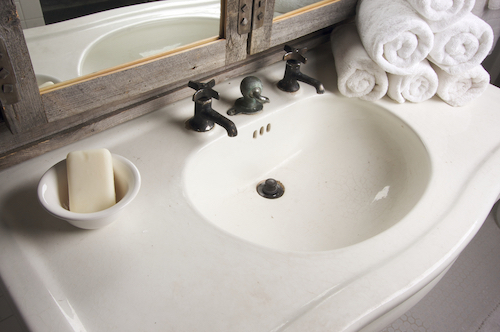 Part of a rustic bathroom’s appeal is in its simplicity. Instead of overdone, gaudy features, it has streamlined, simple elements. Creating a rustic bathroom isn’t about one particular color scheme — you might choose dark browns and beiges or bright whites and blues — but rather about a small selection of calming, natural hues used consistently. Create rustic focal points. Whether you choose a sliding barn door entrance for your bathroom or create rustic lighting fixtures with old black lanterns, feel free to make eye-catching focal points in your rustic bathroom design. Other ideas include copper bathtubs, a chandelier with rustic shades, wood walls, iron hooks or stone bowls. Pick timeless features. Rather than picking the hottest bathroom colors or features that may change a few months from now, try instead to stick to timeless features that can highlight your room’s rustic feel. Features like beadboard or subway or honeycomb tile are choices with time-tested staying power. Incorporate natural materials. From stone or brick walls to wood floors, natural materials work beautifully in a rustic bathroom remodel. If you’re lucky enough to rework a bathroom that already has original features like stone or wood, see if you can refurbish or refinish those elements to look like new. If not, shop around for the materials that will work in your rustic design. Whether you’re remodeling a half bathroom or a large master bath, when you’re interested in rustic style, use the six ideas above! 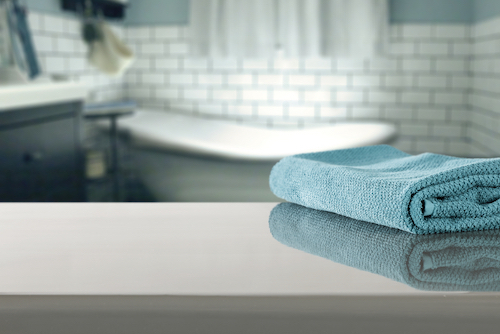 When you’re looking for quality bathroom products — from sinks to showers to hardware — come to Modern Bathroom. Shop our online catalog to find affordable prices and free shipping on the bathroom fixtures you need!